Our standard service features FREE delivery on all orders over £50 and £4.95 for all orders under £50. NB: Exceptions apply to outlying and offshore destinations of the UK. orders below. Deliveries outside Zone 1 - see map - will still be subject to a delivery surcharge. Please use our Delivery Estimator Tool by simply adding a product to your basket and entering your Postcode. 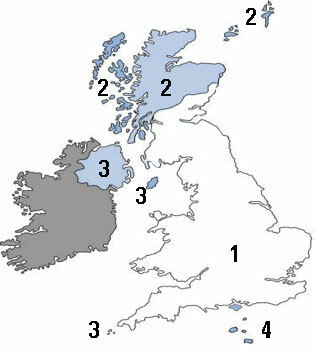 Zone 1: England, Wales and parts of Scotland excluding the Highlands and Islands. Zone 2: The Highlands and Islands of Scotland*. *Extended delivery times do exist for outlying areas in Zones 2, 3 and 4. We aim to deliver your order within 5 working days within the UK. Most orders will be sent out using a carrier service which will require a signature on delivery, however smaller orders may be delivered by First Class Royal Mail (Please allow up to 5 working days for delivery). If you need your order delivering urgently please call us on 0151 372 0265 and we will do our best to expedite your order. Large or bulk orders will be subject to a surcharge depending on weight, size, value and destination of your order. Please add the products to your basket and enter your postcode to calculate delivery charges.